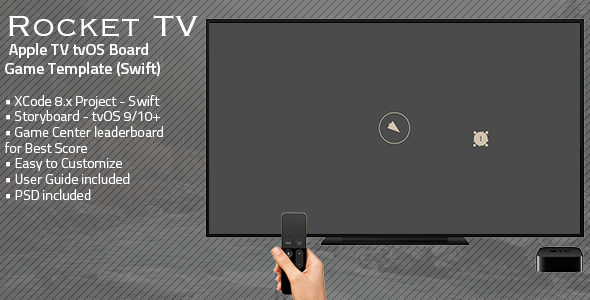 Rocket TV | tvOS Apple TV Game Template (Swift) Created by fvimagination. This templates have specific characteristics, namely: Rocket has features such as Compatible With: Swift, Software Version: Other . You can use this Rocket TV | tvOS Apple TV Game Template (Swift) on Mobile category for action, appletv, arcade, board, center, game, puzzle, rocket and another uses. Rocket TV is a board game where you have to master the highest score you can by hitting clusters on the screen with your rocket. Simply tap the SIRI remote when your eyes catch the trajectory to hit a cluster and fire your rocket! Have fun with Rocket TV, and don’t forget to rate it on your Downloads page! Important Disclaimer: We’ve recently found out that some developers have bought our app templates, reskinned them just a bit and put them on sale on other source code markets smilar to CodeCanyon, saying that they developed and own such source codes. That is a serious copyright infringement, developers who buy our templates are allowed to reskin and sell them as apps on the App Store (accordingly to the License type they’ve purchased a template for), but are not allowed to put our original source codes for sale on source code markets, including CodeCanyon.We will report developers who made copyright infringements to the competent authorities.Thanks.